Stop for a moment and wonder: what's happening in your brain right now—as you read this paragraph? How much do you know about the innumerable and amazing connections that your mind is making as you, in a flash, make sense of this request? Why does it matter? The Reading Mind is a brilliant, beautifully crafted, and accessible exploration of arguably life's most important skill: reading. Daniel T. Willingham, the bestselling author of Why Don't Students Like School?, offers a perspective that is rooted in contemporary cognitive research. He deftly describes the incredibly complex and nearly instantaneous series of events that occur from the moment a child sees a single letter to the time they finish reading. The Reading Mind explains the fascinating journey from seeing letters, then words, sentences, and so on, with the author highlighting each step along the way. This resource covers every aspect of reading, starting with two fundamental processes: reading by sight and reading by sound. It also addresses reading comprehension at all levels, from reading for understanding at early levels to inferring deeper meaning from texts and novels in high school. The author also considers the undeniable connection between reading and writing, as well as the important role of motivation as it relates to reading. 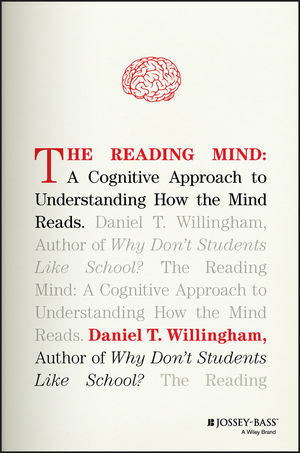 Finally, as a cutting-edge researcher, Willingham tackles the intersection of our rapidly changing technology and its effects on learning to read and reading. Every teacher, reading specialist, literacy coach, and school administrator will find this book invaluable. Understanding the fascinating science behind the magic of reading is essential for every educator. Indeed, every "reader" will be captivated by the dynamic but invisible workings of their own minds. DANIEL T. WILLINGHAM, PHD, is professor of psychology at the University of Virginia. His bestselling first book, Why Don't Students Like School?, was hailed as "brilliant analysis" by The Wall Street Journal and "a triumph" by The Washington Post, recommended by scores of education-related magazines and blogs, and translated into many languages. His second book, When Can You Trust the Experts? How to Tell Good Science from Bad in Education, was named recommended reading by Nature and Scientific American, and made Choice's list of outstanding academic titles for 2013. His companion to this book, Raising Kids Who Read, garnered recognition from NPR and Learning & the Brain. Willingham writes a regular column called Ask the Cognitive Scientist for the American Federation of Teachers' magazine, American Educator. In 2017, Willingham was named by President Obama to the National Board for Education Sciences. He received a BA from Duke University and a PhD from Harvard University.